Service Rank and Number / Rheng gwasanaeth a rhif: Private No. 2997. Military Cemetery/Memorial / Fynwent milwrol: Rhyl Church Cemetery, Flintshire. Ref No Grave or Memorial / Rhif cyfeirnod bedd: 100. Died on Monday 14 August 1916 at Erpingham Military Hospital, Norfolk, aged 18 years following a military exercise accident. Arthur Parr was born on 1 April 1898 at Chester, Cheshire, England. The 1901 Census shows that the family lived at 17 Elwy Street, Rhyl, Flintshire. The head of the family was Agnes Parr, a widow, who was a Laundress. Her husband William Robert Darlington Parr had died in 1899. They had three children – Walter Parr aged 8, Alice Parr aged 4 and Arthur Parr aged 3 years. The family later moved to live at 12 Mona Street, Millbank, Rhyl, Flintshire. Arthur enlisted with 5th Battalion, Royal Welsh Fusiliers at the Recruitment Centre, Rhyl, Flintshire. 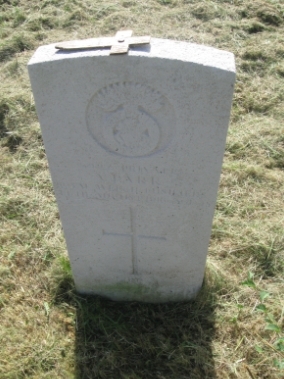 Headstone of Private Arthur Parr at Rhyl Church Cemetery, Rhyl, Flintshire, North Wales. There is a Flintshire Roll of Honour Card for Arthur Parr at the County Archives Office, Hawarden, Flintshire, which is undated and unsigned.